In 2012-2013, nearly 32,000 children across Colorado received comprehensive health care at 56 school-based health centers (SBHCs). In February 2015, John Snow, Inc. (JSI) was hired to identify a SBHC business model and financing strategy that incentivizes efficiency and movement toward sustainability, addresses the primary care needs of the target population, and supports SBHC growth. 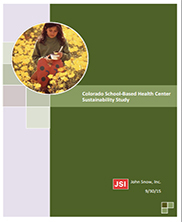 This school-based health centers sustainability study allows funders, including CDPHE’s SBHC Program, to strategically direct funding for SBHCs in an equitable manner that promotes sustainable, high-quality, responsive SBHC services across Colorado communities. School-based health centers (SBHCs) are a unique health care model designed to provide convenient, comprehensive, integrated health care services to children and adolescents through school/health care partnerships. JSI completed a sustainability study and the methods, data, results, and recommendations are all detailed within the report. JSI, 2015.